I am writing to you all, about changes in our fee structure, governance practices, insurance cover, membership system upgrade and future direction of the federation. In conjunction with our insurers, we have developed a member’s information pack, (Available on our web site). It explains in simple terms what coverage the AUF has. It explains claims procedures for public liability and personal injury claims, injury reporting and other more general information. Our death benefit cover has been reinstated this year for all of our sports. Our volunteer and coaches cover has been updated as to our professional indemnity. I believe this is the most comprehensive policy the AUF has ever had and will be a reassuring benefit to our members. It should be noted that this insurance is now costing us in excess of $42,000.00 per year. In 2014 our contract with IMG, our membership system provider expired. It was felt that the current system we were using was becoming antiquated and not user friendly. We also felt that with the increase in mobile technology that we needed to offer a platform that was mobile friendly. Our current platform was far too rigid as it was a three tier system, which meant we had to base our usability requirements around the system. IMG have offered us a new contract on a new platform, one that is mobile friendly and is flexible to be designed around our needs. This will give all levels of our membership greater ease of access, by being able to create as many tiers as necessary. Federal Commissions will be able to access all their members’ data right across Australia. Likewise state commissions and branches, individual clubs will be able to log into the system, and use the email mail out facility for their individual members. There will also be a competition portal, so the organisers of any competitions can set up registration fees for any events. Competitors can pay by credit card and the fees will automatically be transferred to nominated bank accounts. The new system differs in its pricing structure as opposed to the old one. We now pay a monthly fee for the system, but the credit card transaction fees have been reduced. It will cost us a little more but we believe this will be offset by delivering a better system for the members. We hope to have the new system online by October. These new fees which will start in May, when we kick off with our early bird special. You will notice that we know have split the senior and junior fees, between AUF club and non-club members. Your fees will be cheaper if you a member of an AUF registered club. This is because the board has taken the position that we want to be a club based organisation. I will talk further on this later. So generally a senior membership has gone from $75.00 to $80.00, for a registered club member. A non-club member is $100.00; this is proportionate across all the membership grades. We have asked our commissions to submit a list of member clubs. To be a registered club within the AUF you need to have 8 members registered on the AUF data base. Existing clubs that meet these criteria will remain on the data base. If a new club is to be registered then the form which is available on the AUF web site, will need to be filled out and sent to our membership officer. Remember if a club on the current data base doesn’t have the required number of members, it will be removed. The club will need to lodge the attached form and have the required number of members to be renewed on the data base. With continuing pressure being applied by the government, via the Australian sports commission, we have had to evaluate and reassess our governance procedures and reporting. This includes reporting protocols, financial reporting, operational rules, policy adherence Government grants disbursement and member protection. From the top down we will be focusing on specific areas moving forward. If any of our member groups deal with more than $20,000.00 per year. They will need to have their accounts audited, under this amount they will need to provide an income and expenditure statement. This will need to be provided to their parent sporting body. i.e. clubs to state commissions, State to Federal Commissions and Federal Commissions to Federal AUF. This needs to be recorded as all these different levels are handling member’s funds and possibly receiving grant funds. Each club, state commission and Federal commission will need a minimum standard, set of operational rules. Some groups already have these, others don’t. We will be evaluating all current rules in all of our member groups, to make sure they conform to our aims and objectives and a minimum standard. Things that will be addressed are membership criteria, inequalities in voting rights, the need to be club based at state level, state based at a national level and discipline based at a federal level. That member’s rights are reflected equally throughout the organisation. That our member groups follow the principals outlined in our member protection policy. We need to make sure that the different state laws that deal with child protection are being practiced, and that all statutory requirements are being followed. We understand that this will be a lengthy and ongoing process, but one that in the end will make us a stronger and fairer organisation. We welcome any comments or questions on the above. 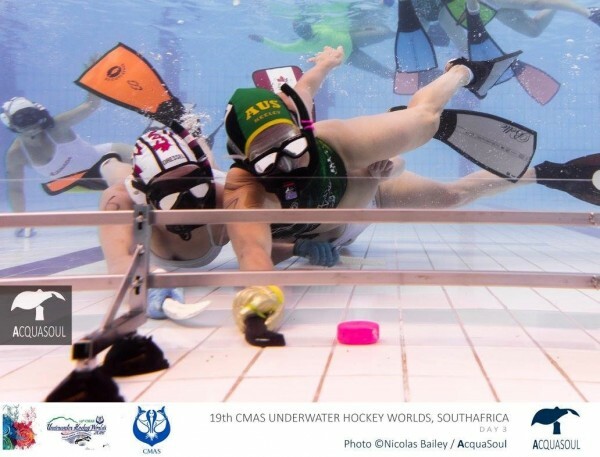 Australian Underwater Hockey teams have dominated the 19th CMAS Underwater Hockey World Championships winning gold in three out of the four divisions. Australia were crowned the world champion team in the Elite Mens, Masters Men (over 35 years old) and Masters Womens (over 32 years old) divisions at the championships held in Stellenbosch, South Africa. The Australian Elite Women’s team placed 6th. The Australian Elite Men team prevailed 3-0 over a valiant Turkish team in the final game of the championship. In one of the most even and closely fought competitions in years, the win was a testament to the team’s focus according to coach David Lambert. “This win was three years in the planning and three years of training. We played to the plan today and our boys got it done,” said Lambert. “We improved game on game through the competition and our three finals were excellent. Today’s result is just reward for our efforts. It just goes to show that Australia’s open style of game can still dominate at the elite level,” said Lambert. Australia’s history making day began early in the day when the Australian Masters Womens team prevailed three goals to one over their South African counterparts. Lena Plambeck and Hayley Digney scored goals in the victory. Playing coach, Kirsteen Reid praised the spirit and determination of her players, “It was an amazing result for us today. It was a tough game but the girls played so well, I couldn’t be prouder,” she said. The win made it back-to-back World Championship titles for the team. The success continued when the Australian Masters Mens team won their gold medal game in convincing style. The Australian’s dominated their Great Britain opponents from the outset scoring a goal in the opening minute. The 4-0 halftime margin blew out to an unequivocal 9-1 win. The team was absolutely dominant, going through the tournament undefeated and defending its World Championship title in the division. The win was the culmination of an excellent tournament by all eleven players in the squad according to playing coach Jason Miezis, “The boys executed the Australian style to perfection today. We played open and skilful hockey,” he said. “We looked to move the puck into space at every opportunity, we did that and the result took care of itself,” said Miezis. With a several young players experiencing their first world championships, the Australian Elite Women’s team didn’t finish in the medals but made great improvement throughout the competition according to co-coaches Eden Brown and Tania McLeish. The 10-day tournament brought together more than 400 players from 44 teams competing across the four divisions. 17 nations were represented at the tournament. Above: Australian Elite player – Belinda Keeley in AUS vs CAN game. 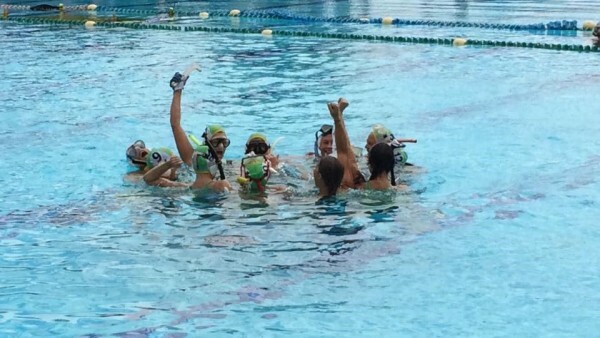 Above: Master’s Women Win Gold. The dark depths of Underwater hockey. Team Australia has been chosen, and are preparing for a very exciting and challenging 29th CMAS World Spearfishing Championships in Peru. The competition is scheduled for 28th October through to 2nd November 2014. All of the Team are experienced spearos coming together from Townsville in Nth . Queensland, the Gold Coast, to Sydney. All divers have been chosen from competition results including the 2013 Aussie titles, and the annual Inter-Pacific Championships. 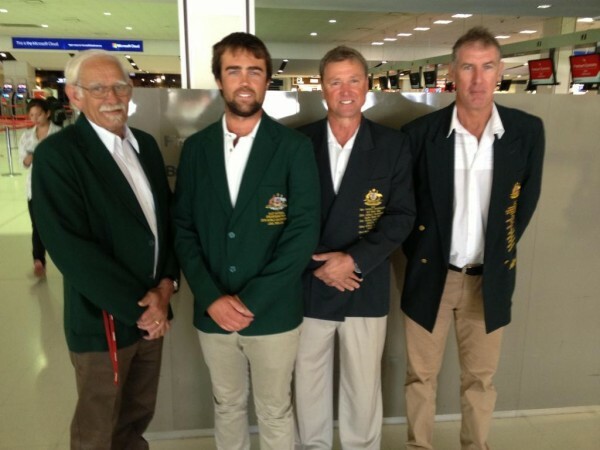 Both Gunther and Adam has represented Australia on numerous occasions in international events, and have the expertize and fitness to excel at this level, and Bryson is an upcoming champion in Australian spearfishing events -placing 4th at his 1st National competition at Kangaroo Island last year. We expect to do very well if conditions become more acceptable, and good viso prevails. Team USA are already there, and encountering poor conditions, with visibility of 2-5 metres, and seas up to 3 metres high crashing in on the coast. Team NZ have a couple of guys there already, and the rest arrive as we do on Monday. Reports are coming in that the Russian Team and a few Greek Team members are getting some fishing also. Lima's climate is in transition between mild and warm, despite being located in the tropics and in a desert. Although classified as subtropical, Lima's proximity to the cool waters of the Pacific Ocean leads to temperatures much cooler than those expected for a subtropical desert, and can be classified as a mild desert climate. It is neither cold nor very hot. Temperatures rarely fall below 12 °C (54 °F) or rise above 29 °C (84 °F) throughout the entire year. Two distinct seasons can be identified: summer, from December through April; and winter from June through October. May and November are generally transition months, with the warm-to-cool weather transition being more dramatic. Relative humidity is always very high, particularly in the mornings. High humidity produces brief morning fog in the early summer and a usually persistent low cloud deck during the winter (generally developing in May and persisting all the way into late November or even early December). Predominant onshore flow makes the Lima area one of the cloudiest among the entire Peruvian coast. Lima has only 1284 hours of sunshine a year, 28.6 hours in July and 179.1 hours in January, exceptionally little for the latitude. Winter cloudiness prompts locals to seek for sunshine in Andean valleys located at elevations generally above 500 meters above sea level. While relative humidity is high, rainfall is very low due to strong atmospheric stability. The severely low rainfall impacts on water supply in the city, which originates from wells and from rivers that flow from the Andes. Coastal districts receive only 1 to 3 cm (1.2 in). Summer rain is infrequent, and occurs in the form of isolated light and brief showers. These generally occur during afternoons and evenings when leftovers from Andean storms arrive from the east. The lack of heavy rainfall arises from high atmospheric stability caused, in turn, by the combination of cool waters from semi-permanent coastal upwelling and the presence of the cold Humboldt Current and warm air aloft associated with the South Pacific anticyclone.The Aussies will meet at Sydney Int'l Airport around 10.30am on Monday 20th October 2014, and fly out on Qantas international bound for Santiago, Chile. The Qantas flight has an expected duration of 12.5 hrs. A 1.5 hr stopover in Chile will see us board a flight to Lima, Peru with a flight time of 4 hrs. Although we leave Sydney at 1225hrs, we arrive in Lima, Peru at 1555hrs the same Monday! Follow this page for details of the trip, which are expected to be updated daily live from Peru, with plenty of photos. Any other clubs/organizations who wish to contribute are encouraged to contact Adrian Wayne ASAP. Much planning and preparation has gone into the trip, and this includes the running of a raffle to raise funds through John Featherstones' publication 'Spearfishing Magazine'. On his website, there is a link to buy tickets for a chance to win many fabulous prizes including a Spearfishing trip to Tonga valued at $2500! Support the Aussie Team by clicking on the link below and buying a ticket or 10 please. Progressive draws for prizes will be carried out from 28th October and the final draw for 1st prize being drawn on Friday 7th November on the Teams return. Winners will be notified by email and phone. NOTE: Team members and their families are not eligible for prizes. and the 1st Aussie Team to be invited to the World Championships in over 10 years. 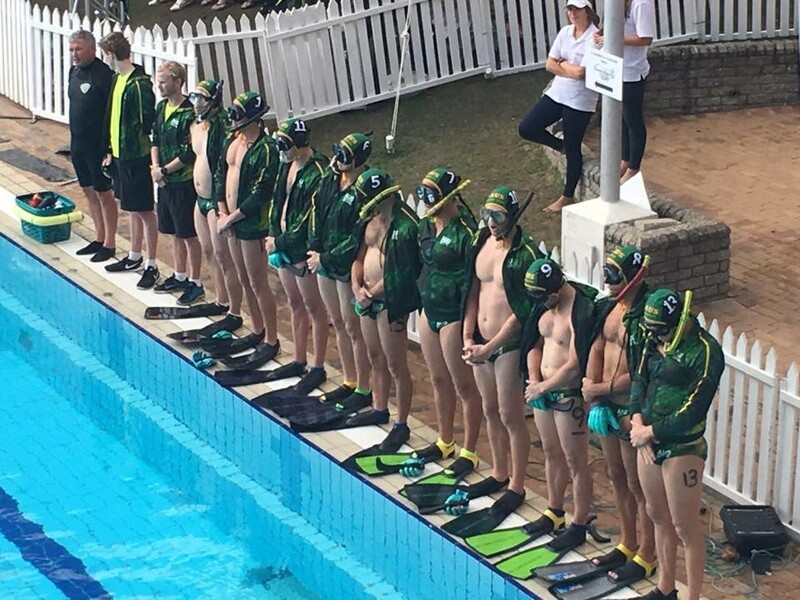 Get behind the Aussie Team and help us bring home GOLD! Results of the 2014 National Spearfishing Championships. Held at Kangaroo Island South Australia. The split this week between the Greens and the Government gives Labor the chance to restore balance to its Commonwealth marine park plans, the peak advocacy organisation representing Australian spearfishers says. “It is clear to us that the Greens had pressured Federal Environment Minister Tony Burke to implement extremist lock out policies in the development of these marine park plans,” Adrian Wayne, Chairman of the AUF, said today. “Now the Greens have walked away from their deal with the Government, we are expecting Mr Burke to restore balance to the issue by re-thinking the unjustified lock out of Australia’s 5 million recreational fishers from the proposed marine parks. Current marine park plans being considered by Mr Burke would result in recreational fishers being locked out of 1.3 million square kilometres of Australia’s oceans. “If that goes ahead, the Gillard Government would be responsible for the biggest angler lock out in history,” Mr Wayne said. “We find it hard to believe that a Labor Government would want to deprive hard-working Aussies of the chance to enjoy a dip in the ocean and catch a feed for their families. In fact, we suspect the lock out agenda of the current marine park plans was forced on the Government via the deal with the Greens. “Now the Greens have broken that deal, we are hoping that Mr Burke will want to talk with us about designing less extremist policies. AUF said the split with the Greens presented the Government with the opportunity to show their true colours when it comes to dealing with Aussie anglers. “Do they want to alienate us by locking us out or do they want to work with us? “The fact is that recreational spearfishers are dedicated to marine conservation. We just don’t want to be locked out for no good reason. Hopefully Mr Burke will now want to work with us and other recreational fishers to achieve balanced and effective marine parks that will benefit all Australians for generations to come.” AUF’s Adrian Wayne said.